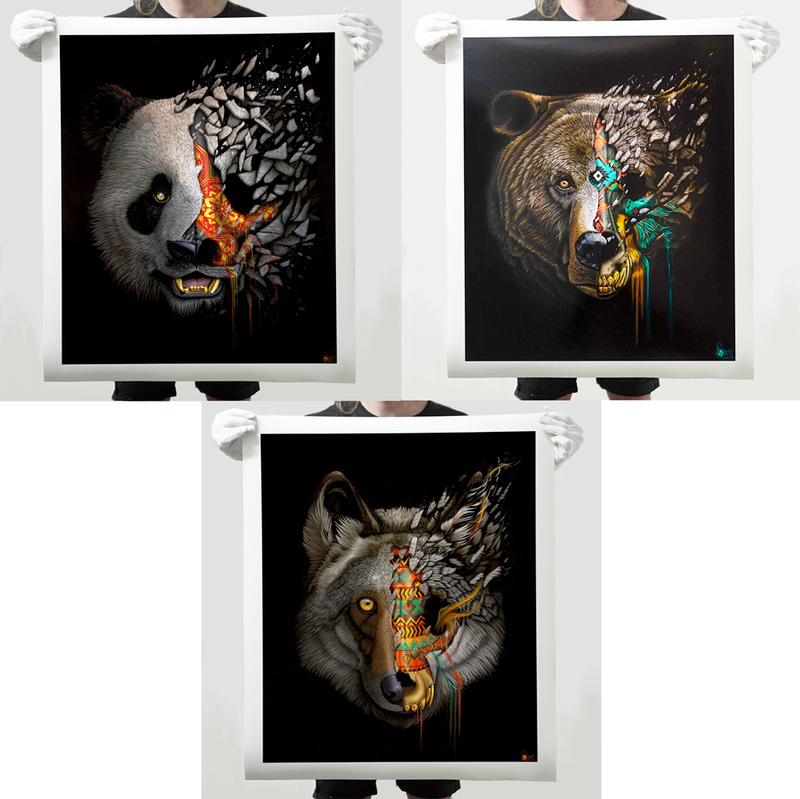 South African artist Sonny and 1xRUN are excited to announce To The Bone, an ongoing print series from Sonny featuring 10 endangered species. In partnership with Discovery, the aim of the project is to help highlight the extinction crisis they are facing. Each week leading up to Sonny’s exhibition in New York City you will be able to purchase new limited edition prints and more with a portion of the proceeds to benefit Discovery’s Project Cat. Read on to find out more about To The Bone by Sonny. 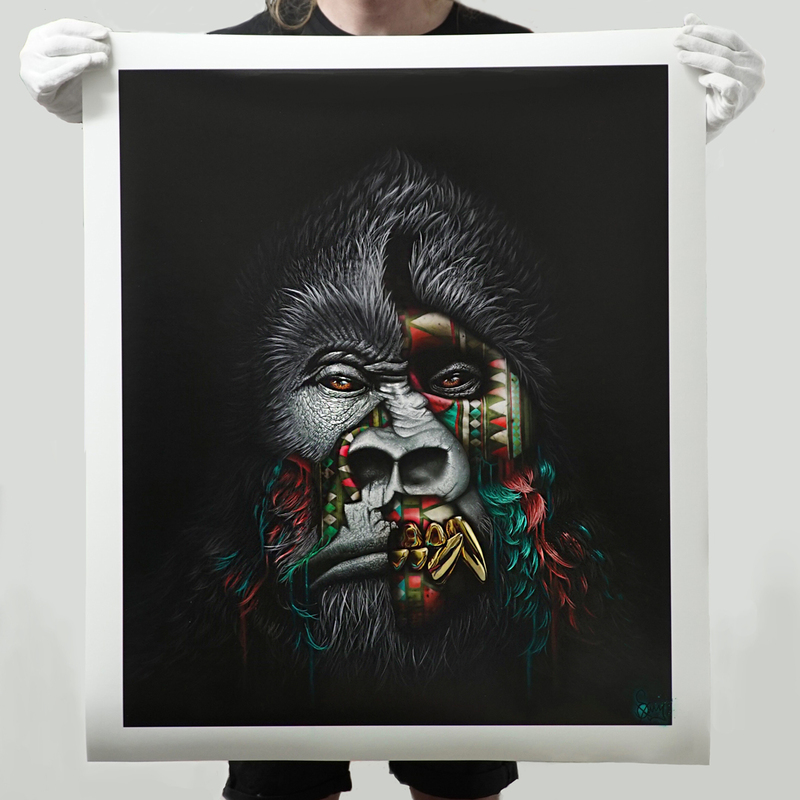 . .
1xRUN: Tell us a little bit about this series, anything immediate you would like us to highlight about this group of images? Sonny: This is my first body of work on canvas. 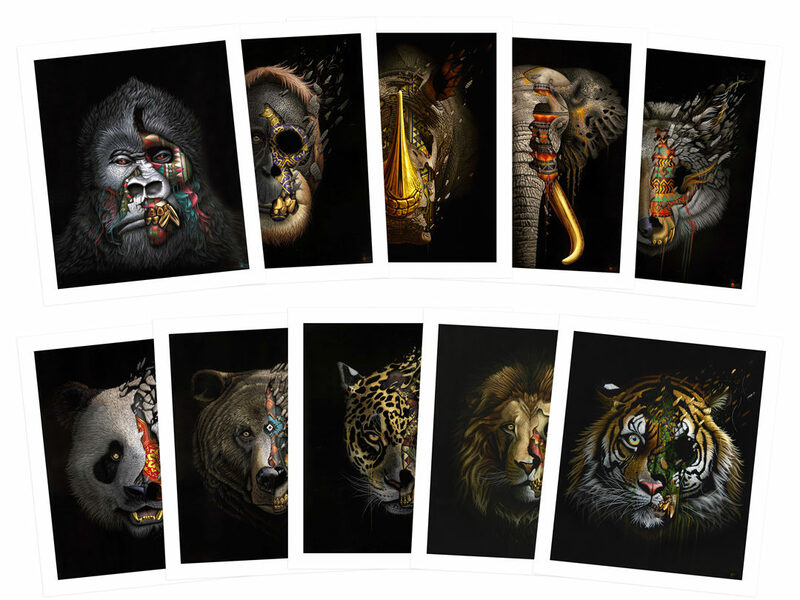 The series showcases 10 endangered animals from around the world and aims to highlight the extinction crisis that we’re currently facing. The imagery blends nature and fantasy in a powerful way, while having a deep underlying meaning too I think. Each animal is being torn or broken apart to reveal their skulls, symbolic of how rapidly these animals are disappearing. The animal’s skulls are adorned with the native patterns of their country of origin, symbolizing how important these animals are to us and showing how by losing them we will be losing a part of ourselves too. Beyond the conservation message, I also tried to bring the true beauty and power of each animal to life on the canvas. Sonny: The concept came around when I was thinking about putting my work onto canvas and getting a body of work together. At the time, I was super concerned about the issues surrounding animal conservation in South Africa and the rest of the world and was frustrated that I wasn’t doing anything to help. Living in South Africa, I’m surrounded by nature and am fortunate to be able to see the beauty of wild animals firsthand, and am also very aware of the issues that our wildlife face. Naturally, animals have become the key subjects in my work. It wasn’t until one day when I was on a game farm and stumbled on a pile of animal skulls, that I got the imagery I needed for the work. As a kid, I was obsessed like most kids with dinosaurs and visited the local museums to look at full-sized T Rex skeletons in awe. I used to REALLY want to see a dinosaur in real life, a dream that would never happen, and this imagery and feeling came back when I looked at this pile of skulls thinking how these animals had once roamed where I stood. It got me thinking that maybe one day future generations will only be able to see skulls of animals in museums and wish they had had a chance to see them in real life too. It will be a fantasy world for them, and today we are lucky to live in it. The future is unclear. Right there and then I knew I wanted to incorporate this imagery in the work and aesthetically I really love skulls, their angles and shapes and their symbolism. I added native patterns to these skulls to represent what these animals mean to each nation that they represent that nation…To The Bone. 1x: The first two editions that we have here are Kunga and Pinda, tell us a little bit about each image, the animal portrayed and why they were chosen? Sonny: Kunga was the first painting that I did and the one that kicked off the whole series. It’s become the face of the project. All the animals in the paintings have their faces stripped away to reveal their skulls in different ways. With Kungu, I wanted him to appear like he’s been at war and still standing, still protecting his territory. He has a certain stare and fierce look in his eye that gorillas have that shows that they will not be intimidated by anything else. He’s the boss, the protector, and ‘peacemaker’, which is where his name comes from. ‘Kunga’ means ‘peacemaker’ in Kinyarwanda, the official language of Rwanda. Pinda the orangutan is much gentler in her look. She is adorned with the native Indonesian pattern on her skull and is a lot softer in contrast to Kunga. Orangutans are struggling because of loss of habitat as their forests are being chopped down, which is why she has a look of sorrow and concern in her eye. 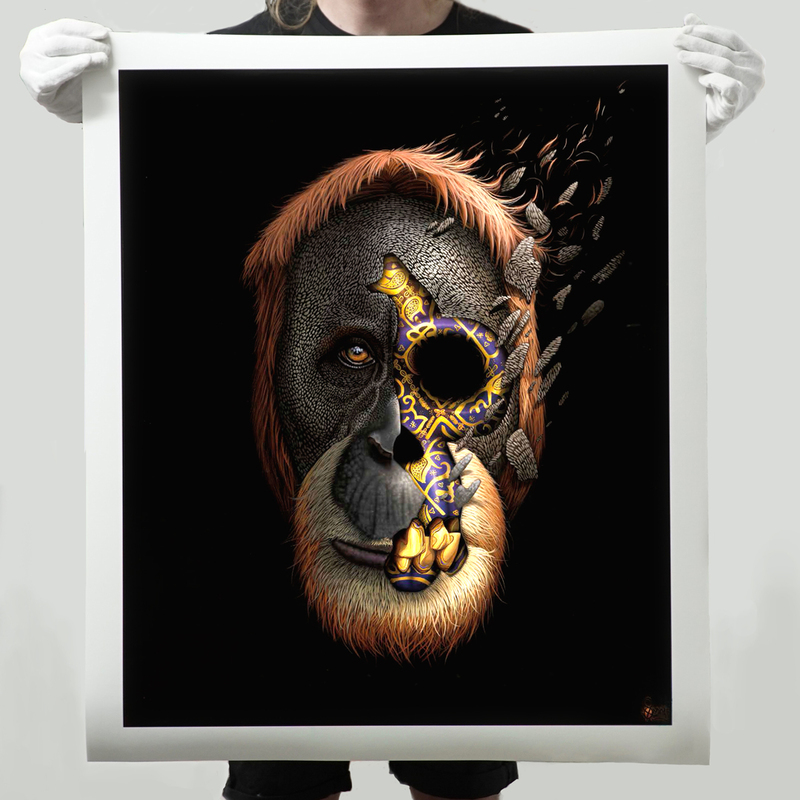 As orangutans are so closely related to humans, I decided to name this piece ‘Pinda’, which means ‘equal’ in Indonesian. 1x: What materials were used to create these original paintings and when were they made? 1x: How long did each image take to create from start to finish? Sonny: They were all different. Some took 2 weeks some a few months. I have no clue why. Sonny: I think what is unique with this work is that I brought my realism to a level and hadn’t had the chance to do before. I spent a lot of time in the studio teaching myself color and training my eye to see it a lot better. I needed to achieve something I had in my head and I had to learn a lot of new tricks to pull it off. Sonny: Mudiwa (left) means ‘beloved’ in Shona. There are up to 40,000 elephants killed every year, this piece celebrates ther beauty of these gentle giants and what they mean to Africa. Kumbukani (right) means ‘remember’ in Chewa. In 2017, 3 rhinos were killed by poachers every day in South Africa alone. 1x: Why should people buy one of these prints? Sonny: Haha, if they like it I think they should buy it! Ha. 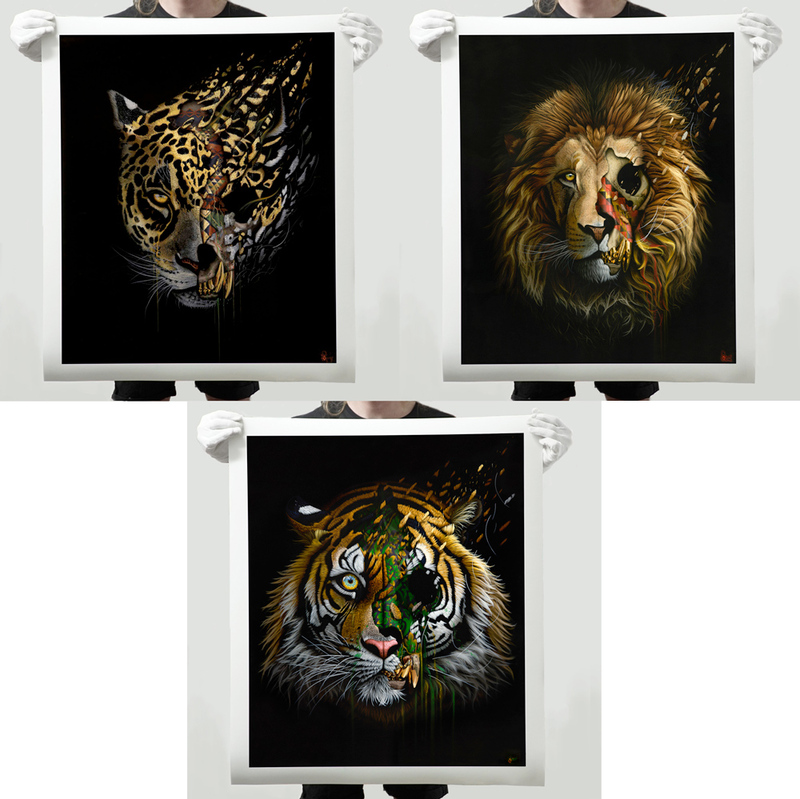 10% of the print sales will also be donated to Discovery’s Project Cat which secures nearly 2 million acres in India and Bhutan in an effort to double the world tiger population by 2022. Sonny: Lohan is from Mayan origin, meaning ‘to be saved’. The Mexican wolf once numbered in the thousands, but are now the most endangered subspecies of wolf in the world. Zouyu is a legendary creature mentioned in old Chinese literature. Despite improved numbers in recent years, pandas are still at risk, with just over 1,800 left in the wild. Manipi is derived from Native American language, meaning ‘walking wonder’. Although grizzly bears have been saved from the brink of extinction in North America, they are still threatened by brutal trophy hunting in some areas. Sonny: I used to doodle and sketch when I was young but I think I first decided to do art and paint properly when I was 23. Not so long ago! I wish I had started earlier! My first piece was a band room we were renovating at the time where I decided to paint all walls and roof to cover up a drunken graffiti session from the night before. Sonny: I think early on it was Case Maclaim, Mad C and Faith 47. I think I was mesmerized by what people could do with cans especially with the realism case and mad C achieved! Inspiring. Now I have so many I cant name one. There are so many artist that are doing such crazy work..the street art scene couldn’t be any bigger right now too. 1x: Last let’s talk about the trio of cats here, Kaaria, Mandla and Saha. Sonny: Yes all the time. I listen to everything really. listening to music for 16 hrs a day you have to mix it up. I flick between all genres of hip hop, rock, house, blues & folk really. Sonny: The first piece of art i think is a mounted print i have of Kozyndan and yes I still have it. Sonny:To The Bone solo exhibition open May 17-19th in New York City. RSVP here.